Beepola is a Windows-based tracker for the ZX Spectrum 48K's beeper speaker. It is capable of assembling songs for use on hardware or emulators, exporting assembly code, rendering songs to WAV, or importing song tables from its supported sound engines from Z80 or TAP files, i. e. Song Ripper (see below). Special FX (Fuzz Click) - Two channels of "coily" sound, both of which can use sustain effects. Features 4 different percussion sounds. The Music Box - Two channels of square wave sound. All notes have a duration of one row. No drums. The Music Studio - Two channels of saw-wave tones. Supports 13 different percussion sounds. Phaser1 - Comes in two flavors - the song-silencing Digital Drums (8 sounds) and lighter Synth Drums (9 sounds). The tone channels are there for square waves by default, although ch2 supports instruments that can produce pitching, de-tuning and phasing effects. Also, you can whack about 100 of these. Savage - Two square waves channels, even though you can change it with glissando, skew, XOR (those two also change the timbre of sound) and FX columns inside the tracker. There are also ornaments which can be used for both tone channels. The drum channel has 5 different sound effects. ROM Beep - Two-channel pausecore beeper engine, which is good for 1-bit music for not just the main menu of a ZX Spectrum game, but for the action itself, too. If you don't want to get low-voted by someone, here on Battle of the Bits, you'd be cautious using this engine for various reasons -- but hey, I'm not nagging you to not use it at all. Plip Plop - An engine with one and only tone channel - which, however, can have different waveforms! There's also drums, but you already knew that. QChan - A four-channel version of Special FX - it's roughly the same, but you get to set the channel volumes for the entire song. Also, you still can set sustains, but it's gonna be the same for one channel in the pattern. Tritone - an incredibly powerful (and RAM-eating, too) beeper engine, which lets you have three tone channels (with each having one of eight different waveforms any time you want) and one drum channel with about 35 percussion samples. Thanks to Beepola's speed limits, the speed one engine abuse is somewhat restricted, although it's still possible. Comes in two flavors - with equal channel volumes and with quiter-to-louder preset. Documentation is also available at the provided link. If you are running on a *nix based system, then the only way to run Beepola would be in WINE, however, found below is lyceum documentation for 1tracker, which can be ported to *nix based systems without use of an emulator. Otherwise, other options include using engines that allow you to use MilkyTracker and convert the resulting .xm into a .tap, such as Tritone, Octode and most of Irrlicht Project's engines. 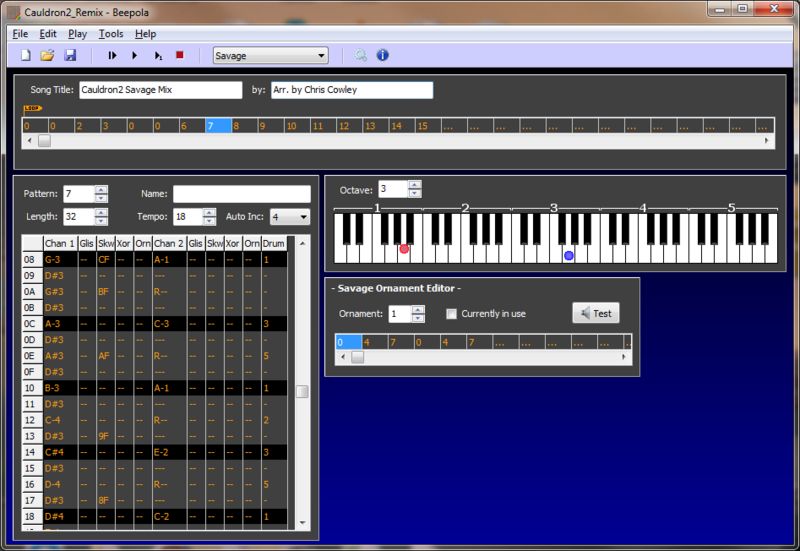 In the most popular version of Beepola, v.1.06, the Song Ripper was able to extract songs only for Phaser1 and WHAM! The Music Box engines. Since v.1.07, however, the scope was broaden to produce Special FX, Music Synth 48K, Huby, Tritone and QChan rips. Making a new song should be relatively intuitive to those who have worked with trackers, it has a simple and intuitive interface.